After playing through The Room Three, I decided to go back and play The Room and The Room Two again. I was reading the letters and thought it would be cool to have all the letters from all the games in one easy place to read. So I posted them all here in order. I suggest only reading them if you’ve played the games, because they do spoil the story. Feel free discuss the possible meanings! 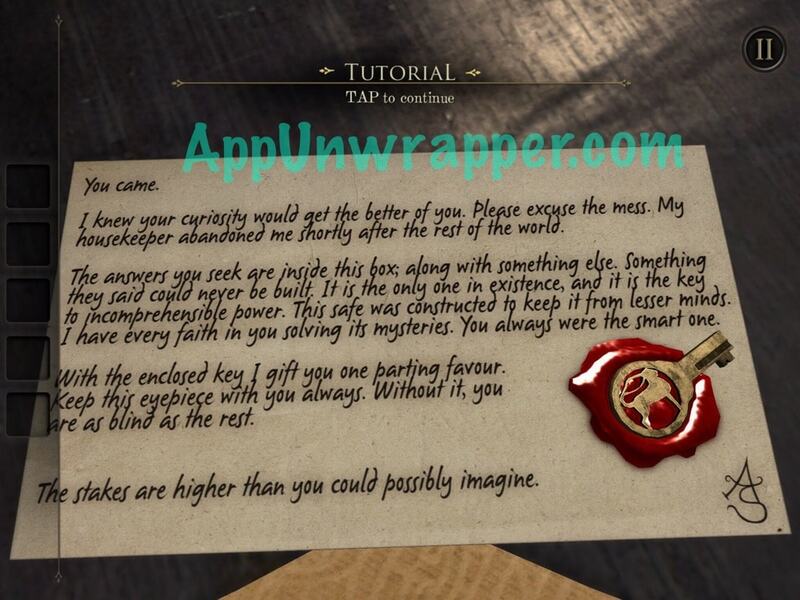 See my walkthrough for The Room Three. See the letters from The Room: Old Sins here. Click on the little numbers below to continue to the letters for The Room Two or click here. 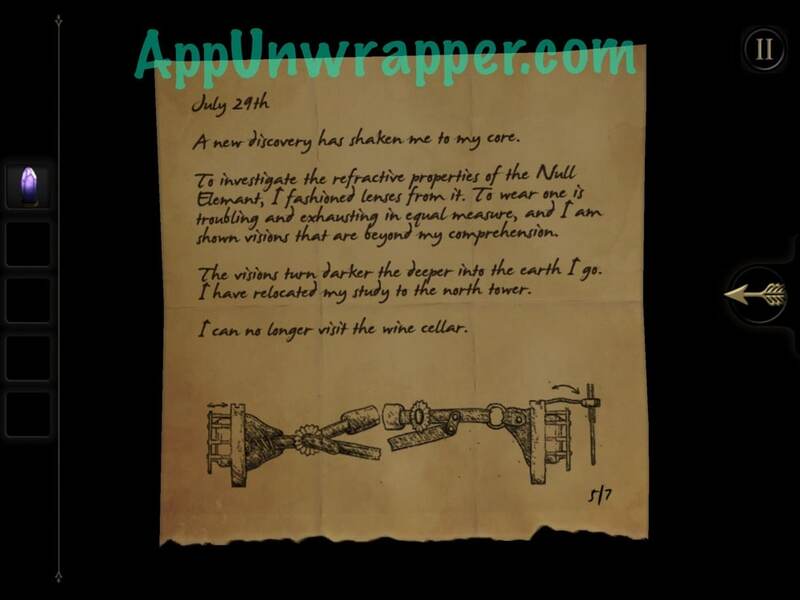 Next PostThe Room Three Review: There Are Rooms Everywhere! thank you! what an awesome idea!! Just give me some time to get everything together! I also need to replay The Room Two. I do hope there’s a fourth game that somehow ties all four endings of 3 into it. Personally i think thath the “lost” is the only ending from which can continue the story of the game, the other three are quite conclusive, at least for our protagonist. Regarding the possibility of a fourth game…the developers said in an interview that, even if the third game would have ended the story began in the first, It will not be the last of the series. Oh really? Good to know! Was worried this might have been the last. That’s the last sentence. The last sentence of the last letter. There is totally a fourth game. The craftsman leaves letters that say he needs a power source. We know the null somehow had something to do with the soul. The craftsman always remarks on the strength of the protagonist’s soul. He tries to trap us to harness our souls for energy. He needs enough energy to escape Grey Holm. He wants to escape into our reality but lacks a sufficient power source, hence the elaborate trap. I didn’t say he didn’t escape in Two. I meant it wasn’t really an escape in the sense that he escaped against the will of the Craftsman. The Craftsman let him get away, knowing he could easily pull him back in. I like the theory, but I also like to add another aspect. The Craftsman is also a prisoner as well. I believe that there are many more people who were also imprisoned by the Null Entity and turned into gems; we will see more if we see the Room 4, because the Null is linked to the soul. And the soul-gems is gonna be a key part to some puzzles we’ll see in the sequel. Macallister (could be a variant of Macalister – R. A. Stewart Macalister) from 1902 to 1909 he was responsible for the excavations at Gezer (Israel). Became director of excavations at PEF Palestine Exploration Fund which was co founded by Arthur P. Stanley (AS). Donald Macalister he was a member of a secret society called the Cambridge Apostles, as was Arthur Smith who was an archaeologist and curator of the British Museum! I agree, the odd building we see through the telescope in the observatory hints at this fact. But more importantly, we ought to pay close attention to the fact that the Null element is powered by the soul; i believe it may play a larger part in the sequel. Maybe the null is a connection from our world to the tentacle beast world. 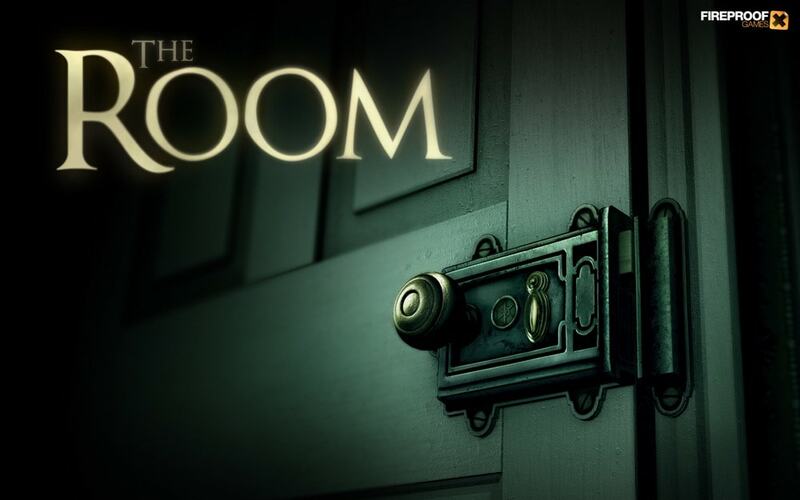 Also Fireproof is making a new game: The Room Old Sins. Judging by the lack of the number, we might have a prequel on our hands. I agree, it might be a prequel to Room 3 , judging from the fact that it is mentioned that a engineer and his wife disappeared one day. Maybe this engineer is Montfaucon? I guess I agree with you except for that Macallister and the protagonist are not the same person because there is more evidence for than against that they are the same person. They both had an argument with AS and they both went to Egypt. There are no debunking facts that I can see. And why would A.S. lie to us? He has no reason to. Especially when the stakes are so high(first note). Did you play the TROS demo to? I think McAllister had assistants. And that AS created another piece from his sketches after Mcallister left. The protagonist from the original series is one of them. I am accounting for the Lost ending, as I saw the Mars Temples and I think that this ending may lead to the Room 4, while the Room: Old Sins focuses on what is really going on planet side. So two diverging but interconnected stories is going on, one that explores the origins of Null and other the effects of gaining knowledge you weren’t supposed to have in the first place. I believe that there are unknown factors related to the Null that ARE in play, that is all. You assume that your theory is correct, but what if there is a twist waiting to be revealed that may cast the things we are seeing in a new light. Something that shakes your confidence in your theory. Horrific truths about Null isn’t uncommon in the Room series and we are merely looking at the tip of the iceberg. This series may turn out to be more Lovecraftian than we think. I someone know how to delete this one please tell me. Thanks for this explanation! And for pointing me at the TV Tropes page, which corresponds with what you said. When I mentioned Montfaucon’s “wife/lover”, that was a mistake, I should have said sister: Lucy. Don’t worry about your English! The main thing is we are from all over the world and we are all united by our interest in these incredible games! Can anyone find the Craftsman’s family motto? I posted the theory twice, because the first time, it was a reply not an actual post. Sorry. I forgot to write that the symbol of The Circle in TR1 appears only in the PC version. Yeah. There’s a PC version of the first two games, and hopefully also for The Room Three and Old sins in the near future. I’ve looked at multiple views of Greyhenge in TR3 (escape & release endings and from the lighthouse) it seems to match the stone structure in the original room game. Which would not only prove its purpose as a portal, but possibly the fact that the Craftsmans family has been so entrenched in the Null that they built Grey Holm by a structure of the Null. As for the altar shown in the lighthouse model, this is built in place of the altar we place A.S.s sample. It was on your twitter. Also look what Fireproof said about us (I email them questions, they know me)! NICE! i knew that symbol had some real meaning for the story of the game! It would be nice (even if unlikely) if in Old Sins we could investigate a little more deeply about the circle, or at least have some clear clues about its existence. I think that the Symbol on Hydrus’(TROS protagonist) is another symbol of the Circle. I believe that the Circle are a secret society wanting to bring Astaroth back from his prison. I don’t think that that’s it. 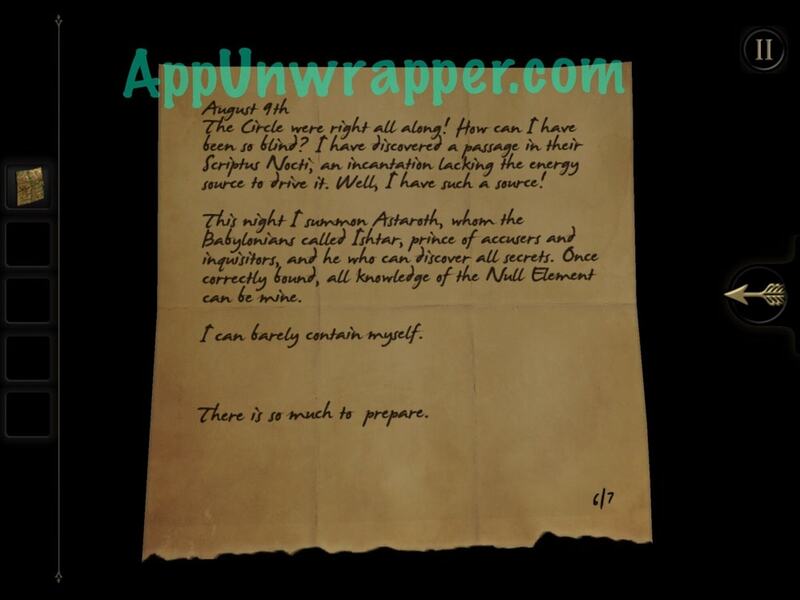 Perhaps there is a connection to asteroth, because of their incantation that AS found, but only to gain information about the Null, much like AS. Perhaps the table with the swirly symbol that holds the blue Null samples at the end of TROS is what they are using as a power source instead of AS’s power scource. The swirly symbol is the seal. I also think the the Circle’s HQ was built around it, as the seal is rough rock, but everything else is smooth marble. Maybe the Circle doesn’t know what it is and Astaroth is influencing them somehow, but I think that the seal is what keeps Astaroth imprisoned. In response to Marks thing with the typewriter, I tried the combination ‘WHATSINTHEBOX’. It then says, ‘Another Box’. I’v been playing on ipad and iphone; there was an apple update to TR2 a couple of days back for ‘bug fixes’. ‘WHATSINTHEBOX’ now works for me! 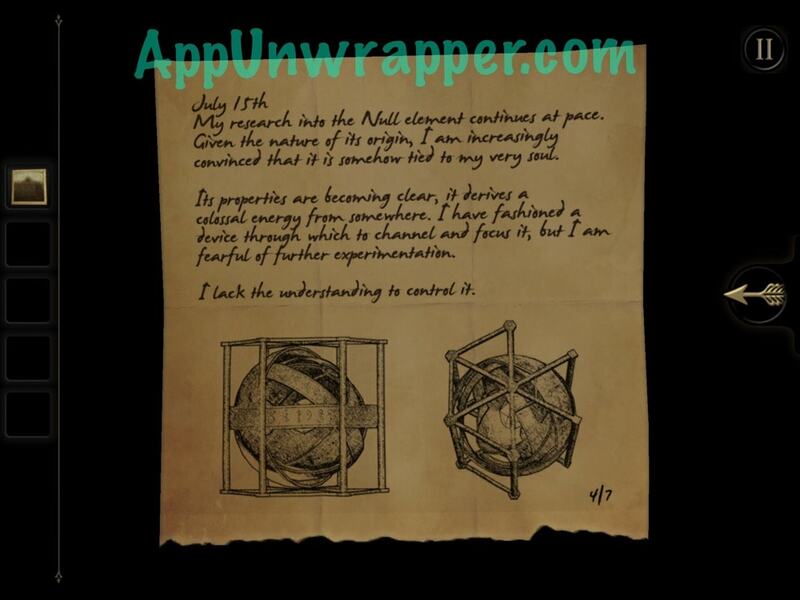 Has any one found the 3 secret radio messages? Radio messages? Where is this at? 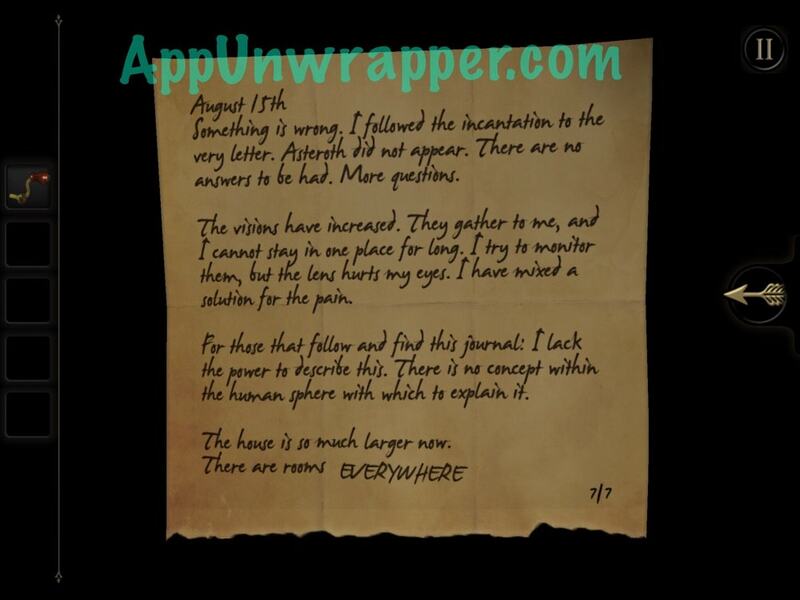 I figured out the radio messages! For those who would like to listen to them too, here’s how to find them. First, you tune the first two radio messages that you find in the game, so the light is green. Then, you go back into the maritime room, and there are two more frequencies that have the jumbled up talking. Both frequencies are specific for a tuner. The frequency on the far right goes with the tuner on the left and vice versa. Let me know what you think of them, since they are very interesting. From what I understood from the messages (because they can be hard to understand.) Hydrus was a valuable asset to The Circle. But, he started to experience side effects from the Null. So, they had him finish his assignments, and imprisoned him. However, he escaped and that’s all we know. I know about the third radio message. When I first explained how to find them, I didn’t know about the third. I agree and disagree with you though. I do believe that the voice is Crowley, but I don’t believe that the messages talk about Hydrus’s predoccesor. Nor do I believe it had anything to do with stealing the Null samples. But, I’ll listen to the radio messages again and take into consideration what you said Montfaucon. There are actually 3 extra radio messages, and the main gist of them is that Hydrus had a predecessor who stole a null sample. Later Hydrus is being watched and is showing signs of disunity so they will terminate his career, most likely by attempting to kill him, Hydrus will probably escape and join forces with these original protagonist. Something else I noticed is that TROS explains why the Royal Institute was so shrill about denying the original protagonist funding for studying the null, as they already know what happens as they were told by Abigail. 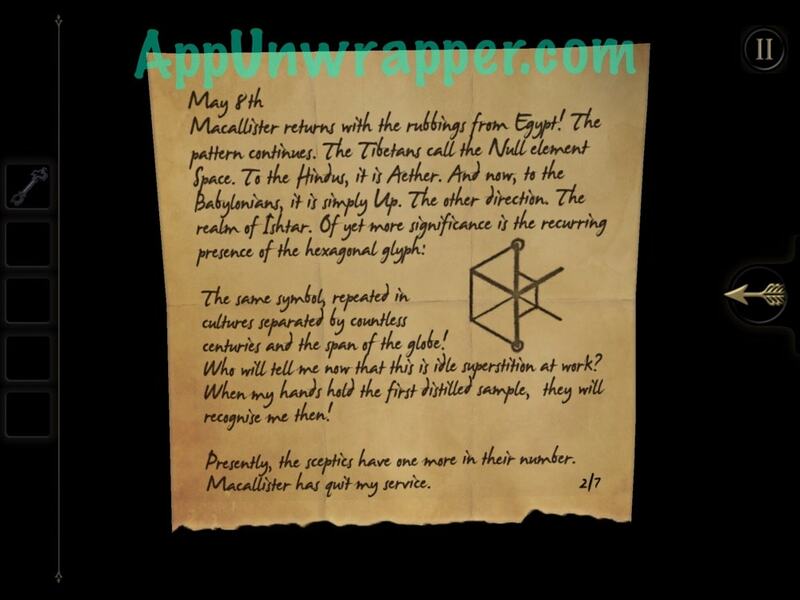 I think this refers to the fact the collector Hydrus is showing sight of disunity, and there were previous collectors who had similar troubles, possibly leading to something worse. Also Montfaucan, I think you’re forgetting that WE ARE HYDRUS. The game hints to it with our notebook that has an H on it, and Fireproof Games confirms it in ‘The Making Of The Room Old Sins’. 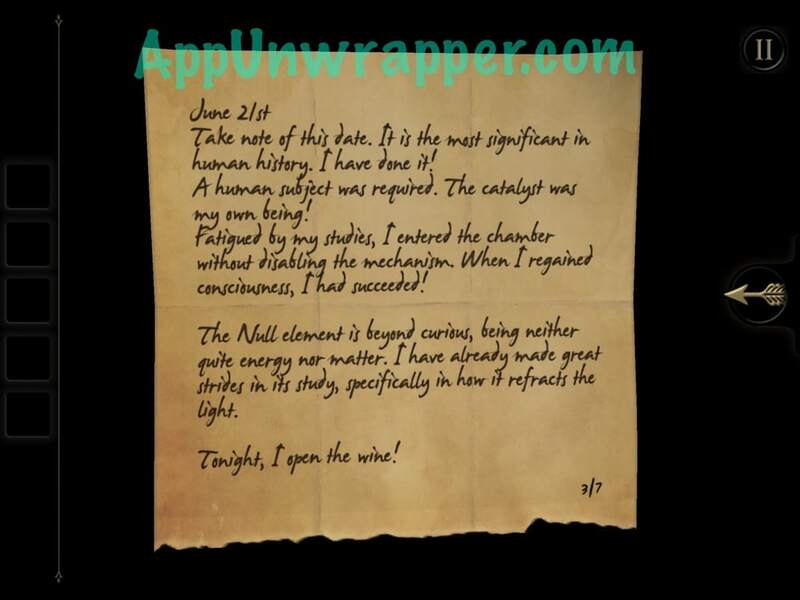 I know we are Hydrus, I was just stating it that way as it was easier for me to write it out, but an other piece of evidence that Hydrus’ predecessor stole a null sample is that the voice states “His escape with our samples was unfortunate” and did you find the extra hints at the end of the game? That is very interesting. As is obvious in The Room, many names and ideas are shown without us really knowing what they are until later reveals and discoveries. This makes me wonder if there is anything that mentions the name Aleister. Ohhhhhh. I see it now. The muffled voice made it hard to understand. Okay. That makes more sense. Honestly, I think that this has practically NOTHING to do with Astroth. He is most likely just an alchemical figure that was only mentioned by AS out of ignorance. I mean Astaroth could be the tentacle entity, if not, then by Astaroth I meant the tentacle entity. Another thing the altar could be is not the actual seal, but a map to it. Maybe the actual seal is in the deep well in the Martian ziggurat. If you listen closely it says Hydrus’ predecessor. If you don’t believe me you can ask fireproof themselves through their email as I did.